Unfortunately I lost your return address. I'd like to send you a thank you note. Whoa. What a beautiful drawing of you. Bravo to the artist! Really cool! Very Moody Blues-ish. Wasnt' that like one of their album covers? Anyway, good job, Morven! I was just wondering if you'd ever thought that you'd be THIS sucessful? You are loved man, and I do believe you deserve it. I always thought you were beautiful. This is a wonderful rendition of you. WOW! That drawing is fantastic! someone has alot of talent..wonderfully done..captured your sweetness. disqus wasn't working? that artist has talent! i wish i had fans who would do that for me. my word verification was aboar. hah! Wow - he did a great job! That's an awesome rendering of you dude! a very talented artist indeed! this is an awesome drawing of you man! I wish I could be as good as this artist. That is truly amazing! Spot on. congratulations to Morven, it is great!! Jorge, I love your work in Lost, and I love how you keep in touch with fans! you are awesome. Also, sorry to bother you, but I would like to ask you a question. I found this video on youtube, where you and other members of the cast (Elizabeth, Yunjin & Michael) say "mmm... cake". I found it weird hahaha and I am curious about what is that about. i would be very tankful if you told us. Thanks! I love the shading, interesting look too.. it's like the Jesus Hurley. I heard one artist say, "It's all in the eyes." In case you didn't see it, you're the shirt at http://teefury.com/ today too! That is gorgeous!! The artist certainly has talent, and you have a face worth drawing!!! as they say in my country, wicked pissah! congratulations! it's awesome. And good job Morven! Did you know TeeFury made a shirt of you today? (the 16th) it'll be gone tomorrow. Did you see this t-shirt Jorge? Trisha: I wanted to thank you for the beautiful drawing you did of me. [Through gritted teeth] Its hanging in my *bedroom*. shading on your upper lip. It's probably the best drawing I've ever done. Happy St. Paddy's Day Beth & Jorge! We're "Lost" without you - where have you been the last two episodes. Jorge, I don't know if you read i09.com or not, but they are avid Lost fans, and in one of their recent posts, they made the statement: "...This show has some of the best actors working in television, including Michael Emerson, Terry O'Quinn, Elizabeth Mitchell and Jorge Garcia." Just thought I'd point that out. You are the rock of this show man. Keep up the good work! You are changing television for all of us. Sorry for posting double comments, but I just finished reading that post on io9.com. (I spelled it with a zero in my last comment, that's incorrect), and you should read it. They idolize you. The posted quite a few clips of your funniest moments. And they tout you as "..the soul of the show". Sorry for using these comments as a way to tell you this, I don't have an email address for you or anything. Have a good day bro! Um Jorge, have you seen this? What the heck was this for?? The only thing I can think of is maybe the Ace of Cakes Ep they shot with you guys, but in any case it's weird. My favorite is Michael Emerson! That is very cool! Do you get a lot of stuff like that? Very well done. I hope the artist gets back in touch with you. I hope Morven reads your blog so he knows that you saw it and liked it. any chance you know what song was at the beginning of last night's episode??? i'm dying to know!!! please? anyone? Very nice and thoughtful of him. He's obviously very talented. I just saw this today and all I can say is WOW. 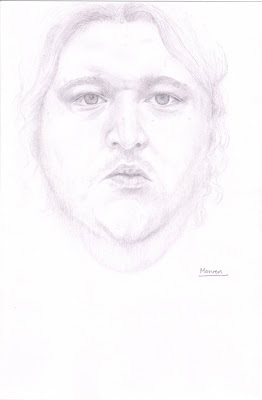 Artists usually try to capture the essence of a person and this artist certainly did that. This is the face of a kind, gentle person! Great drawing- talented artists!! I mean that for both Morven and yourself!! Very nice drawing. I gotta ask, and this might be a bit funny, but I swear you look just like a Jorge Garcia I worked with in San Antonio somewhere back in 1989-90 at North Star Mall. I never was a fan of Lost until three weeks ago when I started watching it on the insistence of a friend of mine; she was VERY persuasive (i.e. a pain in the rear) trying to get me to start up. So, when I saw you, I thought surely there cannot be a coincidence as crazy as that (I mean, how many Jorge Garcias lived in San Antonio then, ha). Regardless of whether or not you're the same Jorge I knew, congratulations on your success. It looks like you might be about to get Stepford Wived. Watch out! Your a lucky man getting to work in Hawaii, we spent our honeymoon there last year, hell of a flight from Scotland!